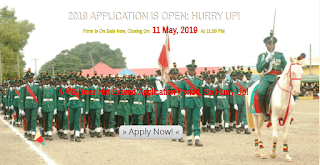 Nigerian Military School (NMS) Zaria Admission Application Form, Eligibility, Requirements, Entrance Examination Date, Time and Venue, Application Guidelines for Admission into Junior Secondary School, JSS1 for 2019/2020 Academic Session. 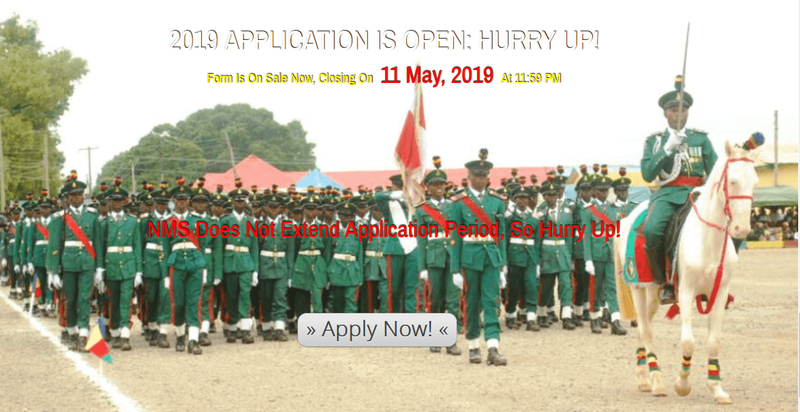 The Nigerian Military School, Zaria, has announced that sales of admission forms for Boys who wish to receive comprehensive academic and military training adequate for their enlistment into the Nigerian Army as soldiers for 2019/2020 Academic Session. Admission into the Nigerian Military School (NMS) takes place once every year. The process starts with filling the admission application form online, followed by a one day pre-admission entrance examination which is conducted at designated centres nation-wide. After the entrance examination, successful candidates are shortlisted and invited to appear for Selection Interview at NMS Headquarters located within Chindit Cantonment, Sabon-Gari, Zaria. Final successful candidates are then offered admission from those who do well both in the entrance examinations and Selection Interviews. Application for admission into JSS 1 for 2019/2020 academic session is now open. Closing date is May 11, 2019 @11:59:00pm. Admission of Boys into the School is strictly for JSS1 ONLY. Candidates for admission MUST not be less 12 years old by September of year of admission. Maximum age limit is 14 years. The Candidate must be a male Nigerian. The Candidate must be at least 12 years old and not more than 14 years old by September of the year of entry. The Candidate must have completed Primary School education. The Candidate must be medically and physically fit. The Candidate must be of good moral character. The Candidate must fill and submit his application form online through this portal. The Candidate must sit for the Entrance Examination on the scheduled date and at the venue chosen by him while filling the online application form. Candidates are to report to the Examination Centre with the ORIGINAL COPY of their Exam Photocard as generated from the portal. Candidates without Exam Photocard shall NOT be allowed to sit for the exam. Candidates invited for selection interview will be made to undergo compressive physical and medical examinations. Candidates invited for selection interview will be required to come with original copies of Birth Certificate, completed Local Government Certificate of Origin and Exam Photocard. Admission into NMS is open to all male Nigerians who fulfill the given entry requirements. It is NOT restricted to only children of Military Personnel. NMS does NOT accept students on transfer from other schools. All candidates must enroll at JSS 1 and then work hard and diligently to complete their education and training up to SS 3. If you have already created your form for this year, you can log in by clicking the GREEN tab. In Step 1, read the instructions carefully, then click the START button. In Step 2, fill in candidate’s personal information and click “Next”. In Step 3, fill in candidate’s contact details and click “Next”. In Step 4, fill in other details and click “Next”. Finally, click “Generate Form” to complete the form creation. Please note that application form fees, once paid, are non-refundable. You can finally submit your Application Form only after your payment has been confirmed. After finally submitting, remember to print out your Application Form, Payment Advice and PhotoCard which you must present at the examination center. NMS Application Form Fee is ₦2,300.00 only; inclusive of Bank Transaction Charges. By paying directly online using your bank-issued debit card (i.e. ATM card). If you wish to pay online, simply log in to the Candidate’s Dashboard and click the "My Payment" tab. When the payment advice slip opens, click the "Pay Online" button and complete the transaction. If you prefer to pay physically at a Bank, simply log in to the Candidate’s Dashboard and click the "My Payment" tab. When the payment advice slip opens, click the "Pay At Bank" button, then print out the payment slip and take it to any of the designated Banks to make payment. All payments (both online and Bank branch) are securely processed by Interswitch. For direct online payments, Interswitch accepts Verve, Naira MasterCard, and Visa. The purpose of this 3-page document is to provide some important useful tips to candidates so as to help boost their chances of getting admitted into the Nigerian Military School, Zaria. 1. Start Early: Make sure you start filling the form early, as soon as the sale of application form is opened on the NMS eForms Portal. Do not wait until the last day to start, because you may not be able to finish filling the form and submitting it before 11:59pm of the last day. NMS does not extend its sale of form; so when you miss it, you miss it! to sit with the person helping you to fill the form and make sure that all data entered for you are correct in every respect! The portal automatically sends important notices to candidates through sms and e-mail messages all through the application and screening processes. If you are using someone else’s email and/or GSM number as your contact details, make sure that the person will receive messages and communicate them to you promptly. NMS does not give second chance to candidates who miss invitations because of communication failure on the part of the candidates. 3. Upload a Proper Passport Photo: The passport photo you upload for your application form must meet all the criteria for acceptance spelt out on the photo upload page of the portal. Candidates who fail to observe all the stipulated qualities of a good acceptable passport photo will have their application rejected without warning. other form of online platforms to defraud unsuspecting candidates or their parents/guardians. Please avoid anyone who comes to you or contacts you and claims to be “Captain This” or “Major That”. Stay away from anyone who comes online and claims to be “NMS Admission Officer” or whatever else they may claim. Also, do not reveal your bank-issued debit card PIN/PASSWORD details to unknown strangers when paying for the form online. For the avoidance of doubt, all correspondences should be sent to our official NMS eForms HelpDesk at helpdesk.nms1954.sch.ng Our official contact phone numbers are 09055522283 and 09055522284. (a) Your payment for the form is confirmed. (b) You upload a correct passport photo. (c) You tick the declaration box and then click the Submit Finally button. 1. Revise Your Math, English Language and General Studies: The NMS pre-admission entrance exam consists of objective questions in three subjects, namely Mathematics, English Language and General Studies. Candidates are advised to prepare well in these subject areas to enable them score high and thereby boost their chances of being invited for the Selection Interview. If possible, try and get ideas of the scope of examination or interview questions by looking for past questions to study, if available. 2. Know Your Centre in Advance: Candidates are advised to try and find out the main road(s) as well as alternative roads to their chosen examination centres at least 48 hours to the day of the exams. This is to avoid transportation delays that may cause them to arrive late or miss the exams on the scheduled day. By trying to find out the roads and location early in advance, candidates will be able to familiarize themselves and identify any potential transportation hitches that may dim their chances of getting admitted into NMS. 3. Get Your Writing Materials Ready: All candidates should bring their pens and mathematical sets (containing pencils, sharpeners, erasers, etc) to the entrance examination centre. No notebooks or textbooks whatsoever are allowed. Candidates are, however, advised to print clear, sharp copies of their Application Form, Exam Photocard and Payment Advice Slip from the NMS eForms Portal and present them at the Exam Centre when requested. 4. Get Good Sleep, Eat Some Breakfast: All candidates are expected to arrive at their chosen examination centres not later than 7:00am. The excitement notwithstanding, candidates should endeavour to have a good night rest before the day of the exam and also have some light breakfast to keep them fully awake and mentally alert during the examination. RECOMMENDED: Nigerian Military Schools Entrance Examination Centers Nationwide. (a) Primary School Leaving Certificate. (c) Completed Local Government Certificate of Origin. (d) Application Form printed from the NMS eForms Portal. (e) Exam Photocard printed from the NMS eForms Portal. (f) Payment Advice Slip printed from the NMS eForms Portal. 2. Improve Your Health and Physical Fitness: All candidates invited for the Selection Interview will be made to undergo compressive physical and medical examinations. As such, it is a good idea for candidates to improve their health and general fitness levels well before the invitation. Candidates are advised to eat healthy meals and observe good hygiene every time so as to avoid illnesses that could make them unfit for the selection process. Doing some simple, age-appropriate exercises at least 4 times a week will also help. Candidates do not need to engage in Olympic-grade physical training activities, however! various personnel, including officers in and out of uniform. Candidates should endeavour to build their confidence so that they will be able to comport themselves well while appearing before a panel of interviewers without any form of shyness or stage fright. Make sure you are well-dressed in simple but smart clothing on the interview day. Also be sure to lift your head up and be audible while answering questions. 4. Stay Informed: Not getting correct information, or getting correct information late, can negatively affect your chances of getting admitted into the Nigerian Military School. Candidates are advised to frequently check the NMS Portal for regular updates at the following URL: https://www.nms1954.sch.ng. Online, By following the outlined guidelines above. Payments for Application Form can be made at any branch of designated banks or directly online using bank-issued debit cards (a.k.a ATM Cards). All payments are securely processed by Interswitch. For direct online payments, we accept Verve, Naira MasterCard, and Visa. All online payment attempts are followed by instant on-screen notifications displayed to you. Results of all payments are displayed onscreen (successful ones in green, failed ones in red). In addition, notification emails are sent to the email addresses specified by candidates in their profile. Depending on availability, SMS message alerts are also sent to the GSM numbers specified by candidates.